Extending from Van Diemen Gulf south-eastward to the Gulf of Carpentaria and Groote Eylandt, Arnhem Land has never been fully explored. With a total area of about 95,900 sq km it includes a largely tropical plateau lying between the Roper and Victoria rivers. Arnhem Land is primarily a large Aboriginal reserve which has been occupied by Aborigines since the late Pleistocene, and there are rock carvings at many sites. The northeast coast was visited in 1623 by the Dutch explorer Jan Carstensz, who named the region for his ship, "Arnhem" . Bauxite and uranium ore are the main exports. Bauxite mined by Nabalco on the Gove Peninsula in the north eastern part of Arnhem Land is shipped through the port of Gove. The Min Min Light is a ghostly phenomena which has appeared in and around Boulia for more than sixty years. The luminous light is reported to be similar to the headlights of a car. It seems to advance towards its target before disappearing, and on rare occasions rolls through the air like a lit football. Could it be a form of ball-lightning? Emerald, in central Queensland on the Nogoa River, at the junction of the Capricorn and Gregory highways 275 km west of Rockhampton and 900 km northwest of Brisbane, has a population of 6,500, and is named for the gems which in the 1880's became a mainstay of the regions economy. P.F. MacDonald, an early settler, established Emerald Downs station in the 1860s. Cattle, sheep, and crops including cotton irrigated with water from the Fairbairn Dam, are now the main products, although emeralds still attract amateur prospectors. The Flinders River is the longest river in Queensland. It rises on the slopes of the Gregory Range 160km west of Charters Towers before flowing west past Hughenden and Richmond and then northwest and north to the Gulf of Carpentaria through two mouths, the Flinders and the Bynce River. It was named for Matthew Flinders by Captain John Stokes of HMS Beagle. Groote Eylandt (Pop. 2000) is 40 km from the mainland across Warwick Channel. It has an area of 2285 sq km and a maximum elevation of 520 ft at its centre, and is the third largest Australian island after Melville and Kangaroo. Sighted in 1623 by Dutch seamen, it was named by the Dutch navigator Abel Tasman in 1644. The English explorer Matthew Flinders made a circumnavigation in 1803. Groote has an airfield and two Anglican mission stations. Alyangula, on the west coast, is the most important town. It produces some beef cattle and tropical fruit, and manganese deposits. There are numerous offshore reefs and islets, one of which, Chasm Island, has caves containing Aboriginal art. Groote Eylandt is one of the world's four major producers of high grade manganese ore, which it has been exporting since about 1966. Milner Bay in the Gulf of Carpentaria mainly serves the needs of the Groote Eylandt Mining Company's manganese operations on the island. The closest mainland town is Numbulwar. Limmen Bight is an inlet of the Gulf of Carpentaria which extends for about 140 km between Groote Eylandt and the Edward Pellew Group and includes Maria Island. The Roper, Towns, and Limmen Bight rivers empty into the Bight. Abel Tasman sighted the bight in 1644, and Mathew Flinders charted the coast in the early 1800's. The Undara Lava Tubes (Undara Volcanic National Park) near the small town of Mount Surprise 275 km south-west of Cairns, is one of Australia's great geological wonders. 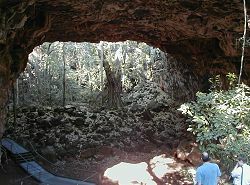 They are the largest, longest and most accessible lava tubes on earth. The tubes contain creatures previously unknown to science, including two species of insect-eating bats. Unique blind insects and colourless shrimps and beetles have evolved without need for the sense of sight or colour camouflage in the black basalt tubes. Two new snail varieties are among the 24 cave-adapted species thus far discovered. Undara volcano erupted 190,000 years ago and spewed 23 cubic kilometres of molten lava onto the surrounding country. Streams of sulphurous lava flowed over the land, spilling out like boiling treacle into various creek beds and other depressions. The surface soon cooled and crusted but the molten lava inside continued to flow, leaving behind the huge hollow pipes...the unique lava tubes. From the air, these rich canopies create a distinct path following the lava flow that occurred 190,000 years ago, when the Undara Crater, one of many on the McBride Plateau, erupted. Seventeen cubic miles (23 km3) of fiery molten lava spewed from Undara. The exterior lava quickly cooled and crusted, whilst the interior lava drained beneath the crusted exterior to leave long, dark, hollow tubes. Ancient roof collapses have since created the fertile pockets in which rainforest plant, insect and animal species now thrive ... and which visitors can now explore. By the time the volcano subsided, over 160 kilometres of lava flow streaked the countryside and the 20 metre diameter tubes had been formed. Over time the roof of the tubes collapsed in places, leaving fertile soakages that sheltered ancient Gondwanaland rainforest from the bushfires. Remnant vine thicket in the soakages is found elsewhere only in Madagascar and East Africa. From the air, the pockets of dark green rainforest make the tube line stand out in stark contrast to the vast golden Savannah country that stretches to the horizon on all sides. In 1993 the Queensland Government proclaimed the area as the Undara Volcanic National Park but retained the Collins family to protect the park, as it has done so well for over 130 years. The Undara Lava Lodge, offers unique accommodation in turn-of-the-century carriages, as well as other accommodation options to suit all budgets. Several of the tubes, or "caves" as they are often called now, are open to the public (others are still the subject of scientific research) but only on guided tours conducted by Lodge owner Gerry Collins or one of the friendly and knowledgeable guides who are all members of the Savannah Guides Organisation. Savannah Guides is a system of professionals who man Guide Stations in some of North Australia's most spectacular wilderness regions. Besides being master interpreters with an intimate knowledge of their specific environments, they are also protectors of their specific locations. On the way to the caves, there's a stop at a granite bluff to overlook the eucalypt savannah woodland stretching as far as the eye can see. Squatting aloft the bluff, your Savannah Guide will explain the history of the lava tubes, using maps and satellite photos as aids. The Guide will interpret the surrounding flora and fauna, pointing out trees and explaining the significance of their common names, and calling your attention to the parade of kangaroos, bettongs and wallabies (Australian marsupials). The park is also home to a wonderful kaleidoscope of bird life, of which over 150 species have been recorded. Barkers tube has become the bats' favoured "maternity and baby nursery". For some months each year, the pregnant females retire there to give birth and nurture their young; as many as 100,000 bats can be in the "nursery" at any one time. During those months, the 682 metre Barkers is closed to visitors. Perhaps the most spectacular stop is the Archway. Here dozens of butterflies flit about your head as you scramble over rocks and pick your way through tangles of vines and fig trees. The latter's long, determined roots work in defiance of the solid lava, breaking through it in the eternal search for water and nutrients. As you enter the tube, you see several fibrous roots stretching down from ancient trees overhead, towards the underground soaks found in the lava tubes. Eighteen metres below ground level at the tube's entrance, the temperature is decidedly cooler and there is the pungent smell of underground life. Over time, bat guano has accumulated with silt and leaf litter to form a false floor which in places achieves a thickness of 6.5 metres. Rock bordered paths and a few hand rails are the only changes made to the caves by man as the Undara Experience owners, and National Parks wish to leave the environment in its natural state. Undara Experience, PO Box 6268, Cairns, Queensland 4870, Australia. The Norman River river rises in the Gregory Range of the Eastern Highlands of Queensland, and flows for over 400 km northwest through fairly flat country to Karumba, a centre for the prawning industry on the Gulf. The river flows through tropical forests in the upper reaches, with many cattle stations along the Savannah banks. Some 75 km from its mouth is the town of Normanton, which can be reached by small ships. The Norman is fed by the Carron, Yappar, and Clara rivers. A group of islands lying off the south-eastern shore of the Gulf of Carpentaria. and sighted in 1644 by Abel Tasman, they were charted (1802-03) by Matthew Flinders and named in honour of Marquess Wellesley (Richard Colley Wellesley), then governor-general of India. The islands are generally rocky or sandy and are covered with scrub and fringing mangrove forests. They are divided into two groups. Mornington, the largest (650 sq km according to one source, 1002 according to another) is the northernmost. Lying 25 km offshore, it rises to 300 feet and has a predominantly Aboriginal population and is serviced by good airstrip. Bentinck (59 square miles) and Sweers (6 square miles) are the largest of the southern islands, both of which also have airstrips. Mornington is the eighth largest Australian island. Sir Edward Pellew Group is a cluster of barren sandstone islands in the Gulf of Carpentaria, near the mouth of the McArthur River on the south-western shore of the Gulf. In 1644 Abel Tasman thought the islands were part of the mainland and named them Cape Vanderlin. Flinders in 1802 proved Vanderlin an island, and he named the group after Captain Edward Pellew (later Admiral Viscount Exmouth) of the Royal Navy. The Edward Pellew Group consists of North, South West, Centre, West and Vanderlin Islands and have a total area of 2,100 square km. Vanderlin, the largest, is 32 km long by 13 km wide. Trains The "Savannahlander" is a 30 year old light motor which journeys twice a week over 150 km of track from Mt Surprise to the old pioneer town of Forsayth, passing over granite gorges, and through spectacular outback country. The "Gulflander" runs between Normanton and Croydon, departing Normanton each Wednesday and returns the following day. The railmotor travels on a narrow guage line about 150 km each way. Two steam trains travel between Atherton and Herberton, and from Ravenshoe to Tumoulin .